Baradene College, Auckland: won the Girls Lotto Premier Tournament (football). Student Hannah Pilley was co-Golden Boot recipient for the tournament and Most Valuable Player for the school. Sacred Heart College, Auckland: won the Boys Lotto Premier Tournament (football). Student Jack Duncan was Most Valuable Player for the school. St Mary’s College, Auckland: Senior Choir students took part in a recording project with singer-songwriter Chelsea Jade. They performed her song Perfect Stranger. St Peter’s College, Auckland: won the national secondary schools rugby top four championship. Rosmini College, Auckland: student Kruz Perrot-Hunt has been awarded a basketball scholarship to Dakota University; he has also been called up to the Tall Blacks squad. Click here. The Kapa Haka group performed a haka powhiri for the Prime Minister and the Minister of Health at a recent North Shore Hospital event. View here. Carmel College, Auckland: student Hayley Rutter has developed a chocolate and vanilla flavoured buffalo milk for premium health conscious buyers, with the Whangaripo Buffalo Cheese Company. She was recognised as a top scholar in technology in the Ministry of Education’s Technology Online. Read more here. De La Salle College, Auckland: two science teachers, Kane Raukura and Ajinesh Kumar , were featured on 1 News for their creek clean-up work. They have weaved the environmentally focused project into their wider science curriculum which has contributed to improved student engagement and achievement. View here. Sacred Heart Girls’ College, Hamilton: student Simone Peers won the GirlBoss New Zealand Enterprise award for her vending machine franchise, Hot Nutz. Campion College, Gisborne: student Madeleine Pittar was interviewed about her work as a Gateway student, and was the only student featured in the article ’Transitioning into the world of work while at school’, page 26 of the 30 October 2018 edition of the Education Gazette (view online here). Staff from Francis Douglas Memorial College. Photo Amy Jackson/Stuff. St John’s College students. Photo RNZ. St John’s College, Hastings: the school has won one of only four national Young Enterprise Teams excellence awards for their project that partnered students and prisoners in the design and creation of rimu bread boards. This is along with their National Whai Tikanga Award for the use of the arts as an integral part of a tikanga programme to encourage a strong cultural identity and support pro-social living and their highly commended status at the 2018 New Zealand National Commission for UNESCO Awards. 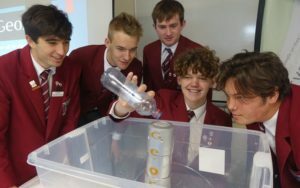 In addition, students Kadyn Newport, Rhyva van Onselen, Shane McDonald, Brad Selwood and Ben Gardiner featured on national news recently, for their invention of a low-cost rain and flood monitor alert system. It detects flooding levels for holiday homes and farms and sends an alert to the owner’s cell phone. Bishop Viard College, Porirua: Head student, Imran Tautu was recognised for his outstanding leadership at the Graeme Dingle Foundation 2018 Excellence Awards. He received the Stars Outstanding Contribution from a Peer Mentor Award, as a mentor making a significant difference in the lives of juniors in their school. St Mary’s College, Wellington: student Charise Perez (Y11) was elected as the Youth MP for Wellington Central. A group of students set up a business for the Young Enterprise Scheme. Their enterprise, called The Final Straw, raises awareness about reducing plastic waste by providing means for businesses to source alternatives to plastic straws and creating marketing material to communicate environmental sustainability. They won a National Excellence Award for their work. Click here to read more. 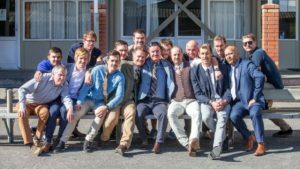 St Thomas of Canterbury, Christchurch: the school was featured in Tukutuku Kōrero | The Education Gazette for their use of gaming mechanics to enhance teaching methods. Read here. St Bede’s College and Marian College, Christchurch: The combined efforts of students from St Bede’s College and Marian College for Canteen Run for a Life resulted in a $160,000 donation to the Canteen organisation. This is the highest amount ever raised in the history of this event. More than 200 St Bede’s College and Marian College students participated. St Kevin’s College, Oamaru: a photography exhibition of photos taken by St Kevin’s College students on a trip to Cuba earlier this year was opened by the Cuban ambassador. Read here. Kavanagh College, Dunedin: student Baiyok Arunya (Y13) was announced as a Brand Ambassador for NZ by Education New Zealand. Read more here. Luca Holloway (Y9) came second equal at the New Zealand Spelling Bee.